The Eye of Agamotto is one Doctor Strange's most powerful relics. It is an item that has been used and passed down from Sorceror Supreme to Sorcerer Supreme all the way back to the original mystical entity Agamotto at the beginning of time. The Eye is considered to be one of Strange's most powerful artifacts and is potentially the most powerful magical artifact in Earth's plane of existence. The Eye of Agamotto will appear in the film Doctor Strange. Images and commentary about the eye were shown at San Diego Comic Con 2016. Weakens evil beings such as demons, devils, undead, dark extra-dimensial beings, and human practitioners of the dark arts. Unknown. There are theories that Agamotto either found it or that he created it. 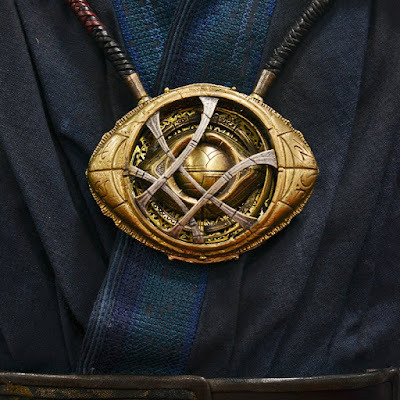 Agamotto is still tied to the eye and it has been suggested that he records when it is used. Video explaining the Eye of Agamotto. Video of a custom made Eye of Agamotto. Not sure who made this but I think its pretty amazing. The Eye of Agamotto will appear in the movie Doctor Strange. Kevin Fiege commented at San Diego Comic Con 2016 that the eye of Agamotto has some probability altering powers, effectively he says that the eye could alter Time. This has led many to speculate that the Eye could be the Time Infinity Stone. Most of the other Infinity stones have been revealed but not Time and Soul. With his abundance of magical artifacts it seems natural for one of the stones to turn up in the Doctor Strange film. As Strange in the comics draws upon many different magical power sources its possible we see a variety of colors based off what spell he is casting and where he is drawing the power for that spell from.One of the theories with the Eye of Agamotto is that when Doctor Strange has green glphys lighting up around him that he is using or drawing power from the Eye. Evidence of this is in the picture of Strange having a green glyph appear from his hand the eye itself is also lit up with a similar green glow. It seems quite possible that as Doctor Strange is a relative newcomber to the magical arts and that he is battling a seasoned sorcerer that he may need to lean on the Eye of Agamotto to even the odds against his adversaries. At San Diego Comic Con 2016 the first close up picture of the Eye of Agamotto was released. It has also been rumored that a eye like relic in the Treasure vault of Asgard in the Thor films is actually the Eye Agamotto. This is actually not the Eye of Agamotto but another powerful magical artifact known as the Warlock's Eye.